It’s time to dive back into the Armor of God! 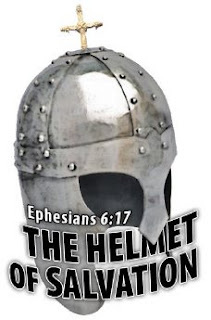 Today I want to take a look at the Helmet of Salvation. Since I’ve already talked about salvation in a previous post, for this I’m going to look at it in the context of the Armor. First we need to remember that the Armor isn’t for the unbeliever. The Armor is for those who have already received their salvation. It protects believers in the battle against the enemy, and the enemy’s biggest weapon? His lies. The helmet serves as one of the most important in holding the entire Armor together. It protects the head, and if an enemy kills the solider by the head, the rest won’t help the solider survive. In the mind is where the enemy plants his weapons of doubt, lies, and deception. So is salvation only limited to our eternal life? The truth is is that God has saved us, not only from the fires of Hell, but from the fires of this world as well. When we recognize the salvation Jesus has given, we get the entire package deal! The fires of this earth: poverty, disease, addictions, abuse, etc. Christ has saved us from them all. I think sometimes we can get the Lord’s will and the enemy’s will mixed up, and I’ve done this countless times myself. We can believe that bad things are God’s will: disease, poverty, etc. We believe God is punishing us or is teaching us a lesson when these things come upon us. When Christ died, He saved us from every thing that isn’t from Heaven when He took His final breath; so disease, poverty, addiction, are only products of the enemy’s lies. And in the end, the lies of the enemy only serve to make us stronger in the battle. They bring us closer into the Lord’s will, so we’ll rest in the goodness of His grace, and in the safety of His arms. So I want to encourage you today, that whatever trial you’re going through, there is salvation, and it’s never left your side.